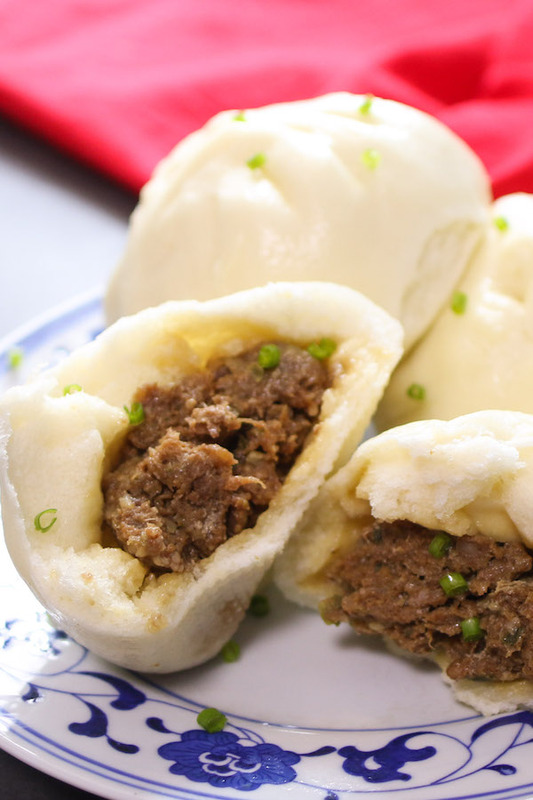 Pork Buns (鲜肉包子 or bao buns) are a Chinese dim sum tradition consisting of soft steamed buns with a juicy and flavorful pork filling inside. They’re a great grab-and-go snack, and fit nicely into any Asian-themed meal or potluck. Plus, kids and picky eaters love them. So good! While people complain that pork buns are a lot of work to make, almost everyone agrees it’s always worth the extra effort. They’re a true a labor of love! 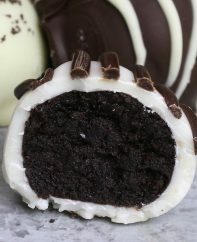 We recommend making a larger recipe like this one, since they go so fast. You’ll get 20-24 buns, and you can always store extras in the freezer. 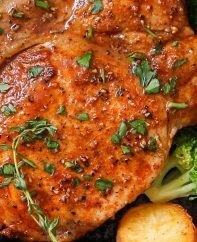 Since the BBQ pork is already seasoned, it requires less additional flavoring than raw pork. There are also the small xiao long bao buns, which are more akin to dumplings. 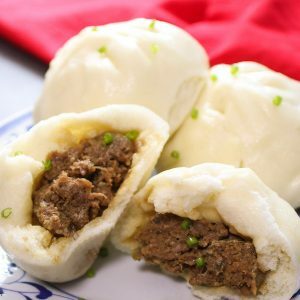 Can you make pork buns with other meat? 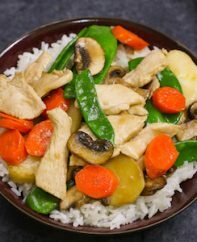 You can substitute ground chicken or ground beef for pork in this recipe. The end results will differ, but will still be delicious. 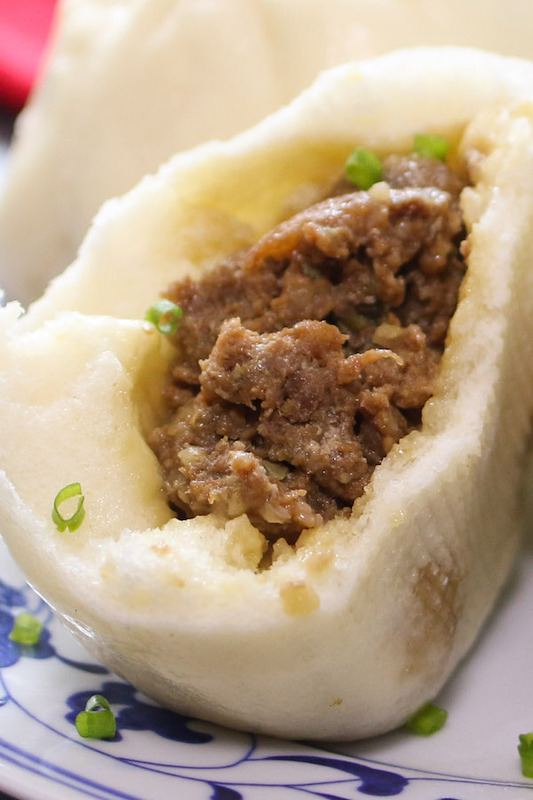 You can also make vegetarian pork buns by substituting in minced tofu for ground pork! Use stackable bamboo steamers to cook more buns at the same time and reduce the number of batches required. Sherry is a secret ingredient that makes the pork extra flavorful and fragrant. If you have some on-hand, give it a try. Use parchment or wax paper paper cut into 3-inch / 7 cm squares to prevent sticking inside the steamer. 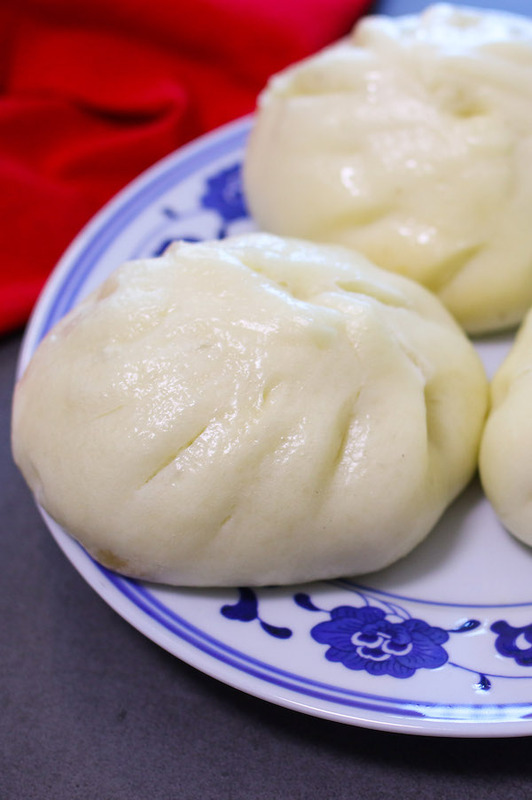 You can cook pork buns ahead of time and store in an airtight container or ziplock bag for up to 3 days in the fridge or 2 months in the freezer. 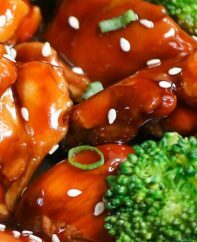 To reheat, simply get out your steamer basket and steam again for 10-15 minutes. You can also microwave them, but the texture will become a bit spongey. 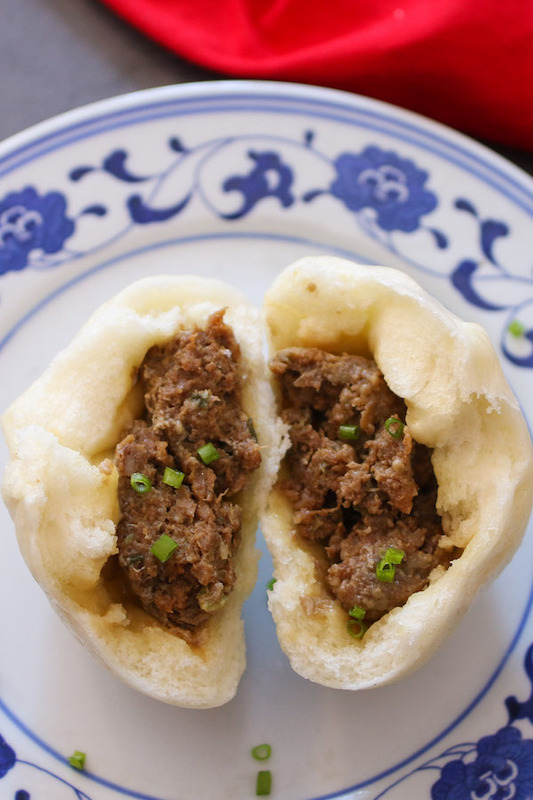 Pork Buns (鲜肉包子 or bao buns) are a Chinese dim sum tradition consisting of soft steamed buns with a juicy and flavorful pork filling inside. They're a great grab-and-go snack, and also fit nicely into any Asian-themed meal or potluck. So good! 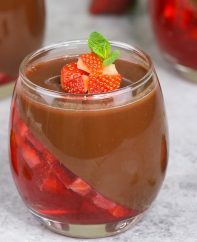 In a large bowl, whisk together warm water, yeast and sugar until dissolved. Set aside for 5 minutes. Add the flour and salt to the yeast mixture. Stir with a large wooden spoon until a dough forms. Turn the dough onto a lightly floured work surface, or into a large stand mixer fitted with a dough hook. Knead the dough for about 10 minutes by hand, or 5 minutes in the stand mixer. Return the dough to the large bowl and rub thoroughly with vegetable oil. Punch down the dough with your fist and turn onto a clean work surface. Sprinkle the baking powder on top and knead for 5 minutes until incorporated. Set aside. 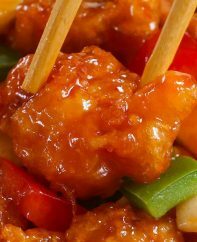 In a medium bowl, add ground pork, soy sauce, optional sherry, hoisin sauce, sugar and salt. 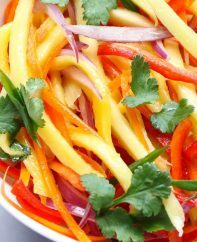 Mix with a fork and set aside for 10-20 minutes to marinate. Place a large skillet on medium heat. Add oil, garlic and ginger and saute for about 30 seconds until fragrant. Add pork mixture to skillet and saute 5-7 minutes until no longer pink. Add water and bring to a boil, simmering for 5 more minutes. Add the cornstarch/water slurry to the pork, and stir for a minute to thicken. Then stir in sesame oil and green onions. Remove from heat and set aside. Take your dough - if it has risen, punch it down again - and cut in half. Then cut each half in 10-12 equal pieces. Cover lightly with a towel to avoid drying out. Form a piece into a ball with your palms. Then place on a floured work surface and roll into a 4-5 inch circle using a mini rolling pin if available. Place 2 tbsp pork in the middle of the circle. Pull up the edges with your fingertips and pinch several times in the middle to seal. Repeat previous two steps for remaining pieces. Once you have 10-12 pieces, you can steam the first batch. Cut 2-inch/5-cm square pieces of parchment or wax paper. Place one beneath each bun and arrange 1/2-inch apart on a steamer basket. Place one quart of water in wok and bring to a boil over medium-high meat. Cover steamer basket with lid and place on wok to steam for 15 minutes until puffy. Remove steamer basket from wok. Add more water and repeat for second batch. Let buns cool for several minutes. Serve warm and enjoy! The dough is ready if you poke it with two fingers and indentations remain. 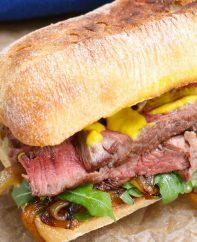 Avoid overcrowding the steamer by leaving a 1/2-inch / 1 cm gap in between the buns to allow for expansion during steaming. Stand Mixer: this will mix your dough ingredients and knead the dough too. I’ve used a 5-quart Kitchen-Aid for over a decade and still going strong. Steamer baskets: Stackable bamboo steamer baskets are an inexpensive essential for this recipe. I like 12 inch / 30 cm baskets, which will accommodate 14-16 pork buns on two layers. Wok: Put the baskets on top of a 14-inch wok for easy steaming. Parchment or wax paper: to prevent sticking during steaming.